The Xbox One X will be priced at $499! Stay tuned to PlayStation LifeStyle’s staff-wide reaction about the Xbox One X very, very soon. Microsoft has officially pulled the wraps off the Xbox One X, it’s new mid-generation gaming console. 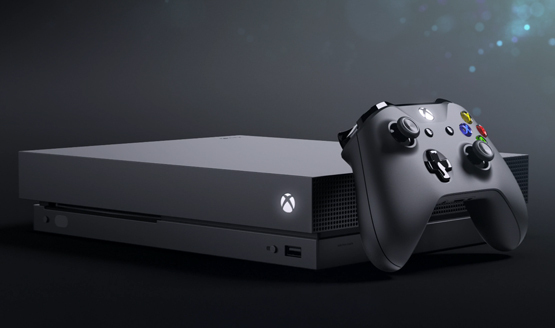 Dubbed the most “powerful power console ever made,” the Xbox One X is said to be “40% more powerful than any other console.” It will be released on November 7, 2017. Lose yourself in worlds built for immersive true 4K gaming, where action is brought to life with 2160p frame buffers. Enjoy brilliant graphic details in lights, shadows, and reflections with High Dynamic Range and Wide Color Gamut. Experience premium audio that puts you in the center of 3D spatial sound. Stream and record game clips in 4K at screaming-fast 60FPS. With 6 teraflops of processing power and 12GB GDDR5 graphic memory, Project Scorpio is 40% more powerful than any other console. Feel true power. The Xbox One X will support True 4K as well as 4K UHD playback and its temperature will be managed by a liquid-cooled Vapor Chamber, a first for a gaming console. The Xbox One X is also the smallest Xbox ever and will support all previous Xbox One accessories & games. Originally teased last year, the Xbox One X features a new GPU that is equipped with 40 compute units running at a clock speed of 1172MHz, supposedly giving it six teraflops of graphical performance. Its CPU has also been improved, getting a clock speed bump from 1.75GHz to 2.3GHz while keeping the same number of cores. The system uses the same AMD Jaguar class processor as the original Xbox One. The CPU and GPU are then backed by 12GB of GDDR5 RAM with a memory bandwidth of 326GB/s, 9GB of which will be usable by game developers while 3GB will be reserved for the system itself. The price of the Xbox One X has yet to be announced but we will update this post once that information has been released.